So the deal closes. It’s “Day 1.” Are you ready for one of management’s big moments? First impressions tend to be lasting impressions, and this highlights the importance of opening moves. Your initial actions make a defining statement about the forthcoming integration process and management intent. Up until this point, people will have been carefully listening to what management has said about the deal, but they believe what they see. Talk is cheap . . . the reality lies in what actually begins to happen before people’s eyes. So how can you seize the moment and use this pivotal opportunity for maximum effect? Follow these seven guidelines and your opening moves will serve as a launch pad for successful integration. To begin with, your opening moves should be born out of strategic calculation—careful deliberation— with deep respect for the broad impact of these first steps. Don’t move on impulse or opt for easy actions that simply represent the line of least resistance. Opening moves should come as clear notes, like a trumpet signaling a call to action. Don’t be hesitant, vague, or equivocal. Done right, your moves will serve as a rallying cry that energizes people and creates alignment. Make your opening moves quickly. Execute with a true sense of urgency. People won’t respond well to a leadership vacuum or corporate inertia. Aim your opening moves toward the topmost priorities. Use these first steps to define for people what matters most at this particular point in time. Opening moves should provide hard evidence of top management’s intent. As such, these moves should be purposeful and of true substance, not random or inconsequential. Neither should they send mixed messages to the organization. Design your opening moves to shape culture in the desired direction. This is your first shot at laying out what the go-forward cultural boundaries will be. So don’t squander the opportunity or confuse people regarding how the cultural imperatives are about to change. Finally, carry out your opening moves with conviction. Kick into gear with authority and determination. 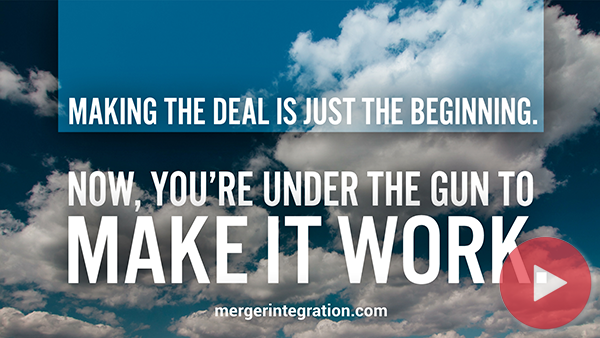 How you begin the integration process carries heavy influence over how you will finish.